CHRIST IS OUR MIDST! HE WAS, IS, AND EVER SHALL BE. The Triodion possesses an inner coherence and unity that are not at once apparent. Why, for example, should Saint Theodore the Recruit be commemorated on Saturday in the first week, the holy icons on the first Sunday, and Saint Gregory Palamas on the second? What special connection do these three observances have with the ascetic fast of Lent? Let us consider briefly the pattern which links into a single whole the different commemorations during the ten weeks of the Triodion. We shall not enter into details, but shall simply seek to indicate the place of each observance in the general structure of Lent. (a) The Sunday of Zacchaeus. 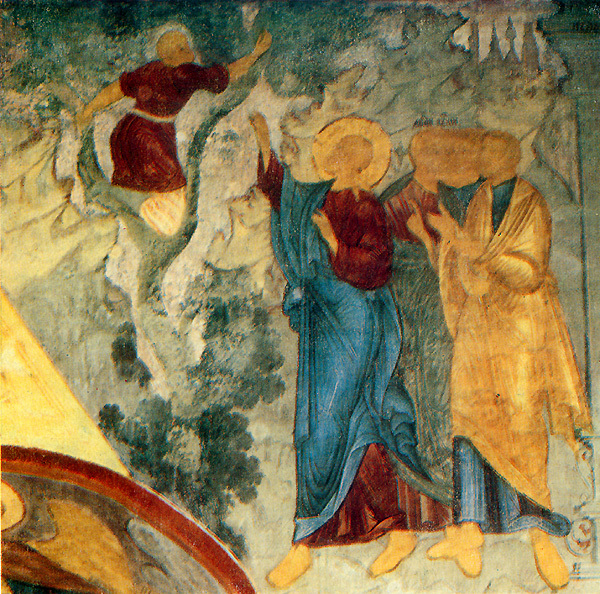 One week before the Triodion enters into use, there is a Sunday Gospel reading which looks forward directly to the coming fast--Luke 19:1-10, describing how Zacchaeus climbed a tree beside the road where Christ was to pass. In this reading we note Zacchaeus' sense of eager expectation, the intensity of his desire to see our Lord, and we apply this to ourselves. If, as we prepare for Lent, there is real eagerness in our hearts, if we have an intense desire for a clearer vision of Christ, then our hopes will be fulfilled during the fast; indeed, we shall, like Zacchaeus, receive far more than we expect. But if there is within us no eager expectation and no sincere desire, we shall see and receive nothing. And so we ask ourselves: What is my state of mind and will as I prepare to embark on the Lenten journey. (b) The Sunday of the Publican And the Pharisee (Gospel reading: Luke 18:10-14). On this and the following two Sundays, the theme is repentance. Repentance is the door through which we enter Lent, the starting point of our journey to Pascha. And to repent signifies far more than self-pity or futile regret over things done in the past. The Greek term metanoia means 'change of mind': to repent is to be renewed, to be transformed in our inward viewpoint, to attain a fresh way of looking at our relationship to God and to others. The fault of the Pharisee is that he has no desire to change his outlook; he is complacent, self-satisfied, and so he allows no place for God to act within him. The Publican, on the other hand, truly longs for a 'change of mind." he is self-dissatisfied, 'poor in spirit', and where there is this saving self-dissatisfaction there is room for God to act. Unless we learn the secret of the Publican's inward poverty, we shall not share in the Lenten springtime. The theme of the day can be summed up in a saying of the Desert Fathers: "better a man who has sinned, if he knows that he has sinned and repents, than a man who has not sinned and thinks of himself as righteous." (c) The Sunday of the Prodigal Son (Gospel reading: Luke 15:11-32). The Parable of the Prodigal forms an exact icon of repentance in its different stages. Sin is exile, enslavement to strangers, hunger. Repentance is the return from exile, to our true home; it is to receive back our inheritance and freedom in the Father's house. But repentance implies action: 'i will rise up and go..." (verse 18). To repent is not just to feel dissatisfied, but to take a decision and to act upon it.